Originally scheduled for April 14, the Louisiana rally was supposed to occur at the same time as 49 other events in state capitals across the nation. The purported intent of the April 14 NCCPA rallies — “Americans for America” — was to serve as gun owners’ civic response to the “March for Our Lives” protests that mobilized over 1 million people in dozens of cities across the U.S. on March 24. The rallies were more than simply an ardent defense of gun rights. As the Institute for Research and Education on Human Rights initially reported, three of the individuals administering and moderating the NCCPA’s national Facebook page showed ties to, or signs of ideological affinity toward, far-right extremists. Page administrators Matthew Johnson and David Clayton both hold leadership positions within the Three Percent Republic, an anti-government extremist group. Johnson, who often goes by the moniker “gatorthreepercent” (a reference to his Florida residence and Three Percenter ideology), also helps to run a far-right political group called Patriots United for Freedom-PAC (PUF-PAC). Moderator Quintin Lyman has posted pictures of the Three Percenter logo on his personal Facebook profile. 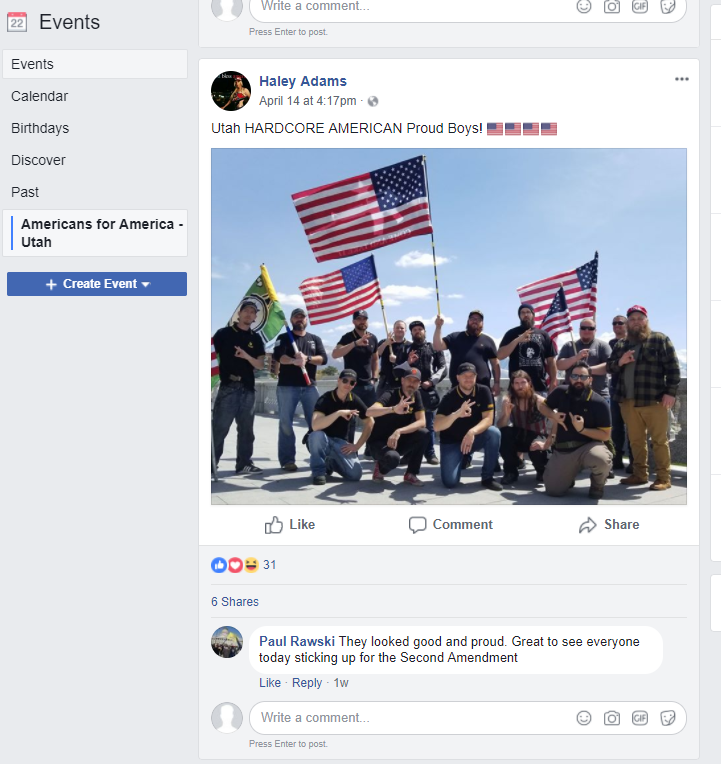 Hatewatch has identified a fourth individual instrumental in co-administering many of the NCCPA state chapter Facebook groups, Melanie MacDonald. 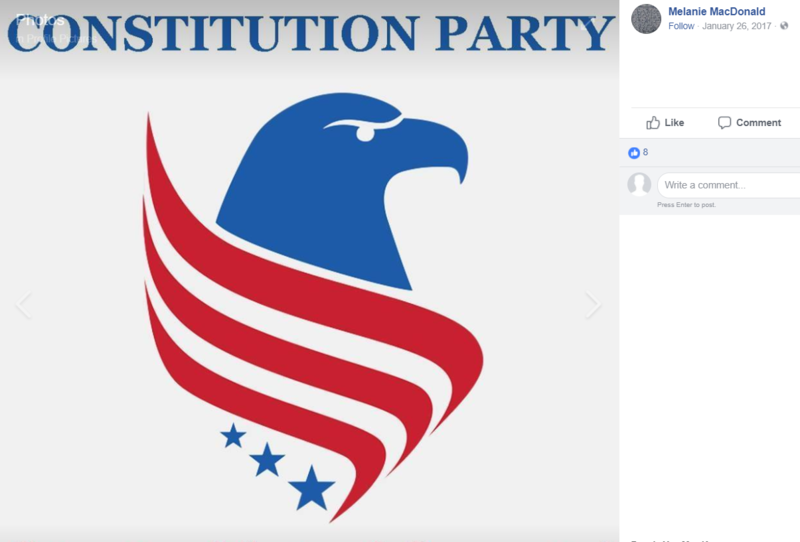 On her personal Facebook profile she posted logos of the Constitution Party, an organization whose state chapters have been listed by SPLC as anti-government extremist groups. However the NCCPA’s ties to far-right anti-government extremism go well beyond these four individuals. Despite the “no extremists” rule and attempts by some state activists to deny ties with far-right extremism, Hatewatch found at least 33 states where the NCCPA sought to organize its own rally and had associations with the Patriot movement. Associations included rally organizers and speakers who expressed support for movements and groups directly associated with antigovernment extremism, as well as identifying several examples –– such as Indiana, Arizona and New York State –– where the logos of Three Percenter and Oath Keeper groups were displayed on NCCPA event flyers. The most frequent type of association found was individuals who expressed support for Three Percenter ideology, but not for a specific group. Those who did express support for specific groups, included ones that operate nationwide such as American Patriots Three Percent, Oath Keepers, the Constitution Party, Lightfoot Militia, and United Patriots Three Percent, along with various groups operating within particular states such as the Illinois State Militia, Utah Unorganized Constitutional Militia, First State Pathfinders, Missouri Brotherhood Militia and the Freeman Party. It was not uncommon to see local militia and Three Percenter flags being flown at many of the NCCPA-organized state rallies. At the Arizona rally, members of one militia group, the Arizona Liberty Guard, arrived in an armored personnel carrier. Members of the Patriot movement weren’t the only ones who showed support for the rallies. In Georgia, the Atlanta rally was organized by Chris Hill, leader of the Three Percenter Security Force (IIISF). In addition to its anti-government views common to most militia factions, IIISF associates are also notorious for their anti-Muslim hate rhetoric and actions — something that has been a point of contention among militia groups and others. In North Carolina, the Raleigh-based News & Observer reported that Tara Brandau and her boyfriend Ryan Barnett (described by the paper as Tara Brandeau and Brian Barnett) attended the event. Brandau is an active member of the Florida IIISF and has ties tothe League of the South, a secessionist neo-Confederate hate group. In Utah, a group of men from the state Proud Boys chapter showed up in support. The Proud Boys is a hate group that frequently uses anti-Muslim and sexist rhetoric and spreads white nationalist memes online. In Tennessee, invited speakers included Nashville mayoral candidate Carol Swain and gubernatorial candidate Mae Beavers, both political long-shots. Swain, who is African American, was criticized for praising a documentary that defended white racism, while Beavers gained notoriety for attempting (and failing) to organize a “Homeland Security Summit” featuring three blatantly anti-Muslim speakers. Shortly after all but the Louisiana rally had concluded, NCCPA associate Matt Johnson attempted to spin coverage of the low turnout. In a blog post on the PUF-PAC website, titled, “Thousands Rallied at Their State’s [sic] Capitols,” Johnson asserted, “The turnout, was actually not as low as the media would like for you to believe.” He pointed to a handful of examples he considered successful, including the Connecticut rally which he claimed “as much as 2,000” people attended. Days before the events, David Clayton of West Virginia told the Associated Press that he hoped attendance would also reach 1 million nationwide. Howeversources supportive of the gun protests provided attendance numbers showing that NCCPA’s rallies fell far short of its desired goal. Several of the NCCPA rallies were dogged by various factors that lowered attendance. 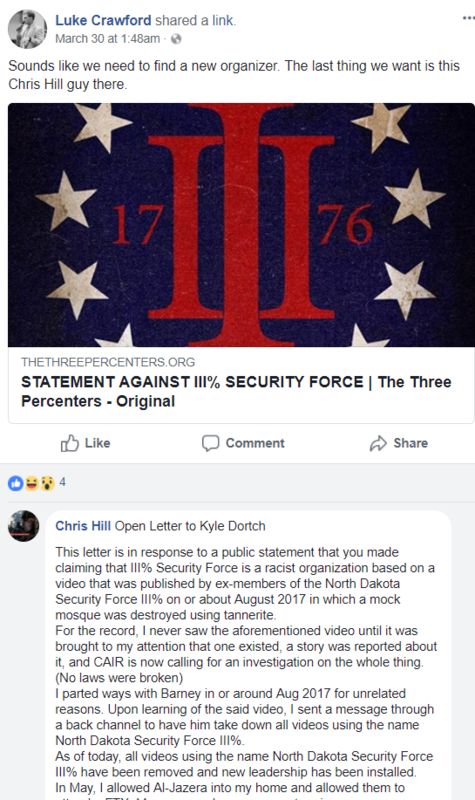 In the run-up to the event, controversy surrounding Chris Hill and his IIISF organization resulted in in-fighting between prospective attendees. One individual voiced concern about optics at the rally and wanted to convey the impression that gun owners “aren’t just a bunch of militia,” asking that attendees avoid displaying Confederate flags and open-carrying weapons. Others still expressed discomfort with Hill and the IIISF’s prior anti-Muslim antics, going so far as to posta condemnation and complete disavowal of Hill and his IIISF faction by a rival militia group called The Three Percenters – Original. Despite seeking to portray their April 14 events as a defense of Second Amendment rights in the wake of another mass shooting, it’s clear that the NCCPA rallies were much more than that. From top to bottom, the NCCPA is permeated by antigovernment extremists and its rallies were reflective of that. 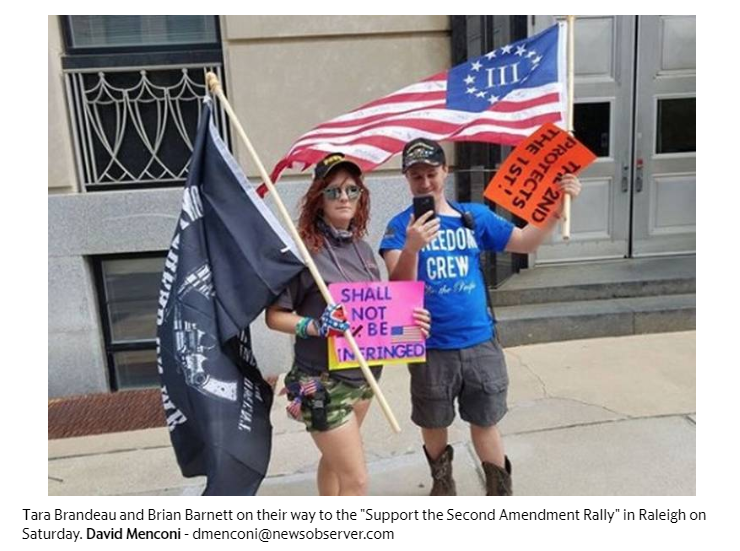 Far from representing the views of most Americans, including other gun owners, the low attendance at its rallies strongly suggest the NCCPA and its supporters in the Patriot movement only represent themselves.